KyivPride: Time to tell our story to the world! We started KyivPride only two years ago, but it seems like we already had a decade of fighting for the Pride movement in Ukraine. We survived a lot. We experienced defeat and victory, neglecting and loving support. When we, a group of activists, started our Pride initiative, not all members of our community greeted it; today after only two years, everybody wants to join the KyivPride. In 2013, we made the first ever Pride March of Equality in Ukraine. Finally this year – after Maidan and Revolution! – the Mayor of Kyiv, Vitaliy Klitchko, said, that it was “no time for celebration with gay parade on Kyiv’s city streets”, showing full misunderstanding of the issue of Human Rights for LGBT-people in Ukraine. We were discarded again to the very beginning of our way of advocating LGBT-rights in Ukraine. I believe our story already needs to be told. And now we have a chance to create a real documentary about our Pride. In 2014, a group of KyivPride founders was invited to the city of Toronto to participate in the World Pride March. The first ever appearance of a Ukrainian delegation at Pride in Canada was filmed and documented by the Canadian documentary filmmaker, photographer, and trans*activist, Michelle Emson. The story of KyivPride inspired her to create the original film The Pride of Ukraine – Inspire a World of Change. While documenting the World Pride week events in Toronto she was impressed by the historic parallels between the two cities. Almost 30 years ago, Pride in Toronto started from a demonstration of just 100 people, whilst just two years ago, the first ever KyivPride began with a violent homophobic attack. After the World Pride she addressed KyivPride activists with the idea of a documentary which will tell the world the history of KyivPride and our efforts to make the Ukrainian government listen to the LGBT-community. Michelle Emson together with Ukrainian activists created the KyivPride Canada group and we started the Pride of Ukraine documentary. This film will open up the story of the first Ukrainian Pride from 2012 to 2015. It will tell about commitment and support that LGBT in Kyiv got from its sister city Munich. It will show Ukrainian activists’ courage. 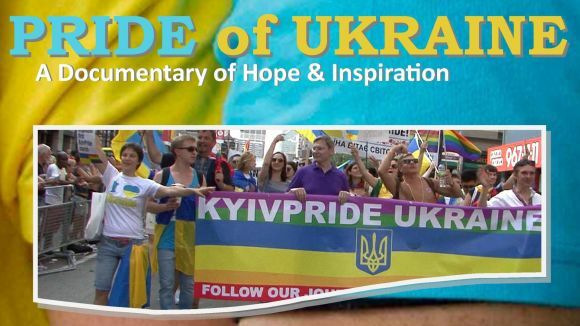 Today we, KyivPride Canada, have over 30 hours of footage made and gathered for “Pride of Ukraine”. We plan to present it to communities and politicians in Canada and Europe and of course in Ukraine and to raise more attention for our fight all over the world. Today, when our country is involved in a war conflict, LGBT-rights in Ukraine are at risk. We need more support from the world and we believe that “Pride of Ukraine” will raise more awareness about the issue of Human Rights in our country. As we plan to release the Pride of Ukraine documentary in March 2015, we already started the postproduction process for which we need people’s involvement. We encourage you to support our crowd funding campaign here https://www.indiegogo.com/projects/pride-of-ukraine and spread information about it. Please make your input in advocating Human Rights for Ukrainian LGBT!